There’s always a contest going on over at Food 52. I submitted my Bacon and Shiso Fried Rice and was surprised it was selected as a finalist! I would love this recipe to end up in the cookbook and shared with others—it’d be great to have a Japanese dish represented—so if you have a moment, please vote! You’ll have to create a username, but I promise it’s pretty painless. You can also watch Amanda and Merrill cook the two finalist recipes here. If you’re not familiar with Food 52, it’s a project started by Amanda Hesser and Merrill Stubbs. They have a call for submissions for different categories (like “Your Best Pancakes”) every week, asking people to send in their recipes. They narrow the submissions down to 2 and present it to the people for a vote. The winner will be included in a cookbook that will be printed at the completion of 1 year. I like this bottom-up approach because it’s a forum that celebrates the home cook—food that was modified, refined, or imagined in people’s home kitchen. Like I said, there’s always a contest in the works. Right now they’re accepting submissions for “Your Best Broiled Steak” and “Your Best Polenta Recipe.” These kinds of contests only are as good as the recipes submitted, so if you have a killer dish I encourage you to share! 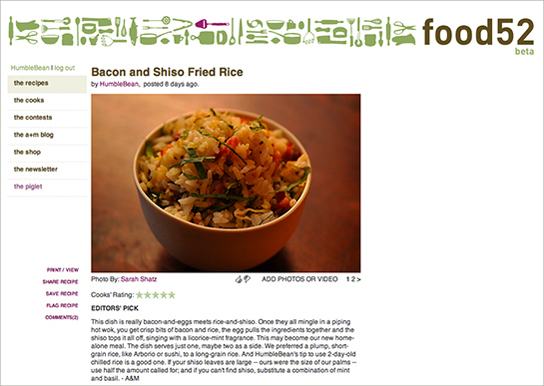 This entry was posted in Perspectives and tagged bacon and shiso fried rice, contest, finalist, food 52. Bookmark the permalink. Post a comment or leave a trackback: Trackback URL. My vote is yours!!! Also, thanks for introducing me to the site! Thank you, Katerina! Hope you have a chance to explore the site and submit a recipe—it’s such a great forum for food enthusiasts to share and interact. Thanks again for your support! Congratulations Azusa! Your recipes are awesome and you deserve to be a finalist. You’ve got my vote. Good luck! Thank you, Mike! You are so sweet—I really appreciate your support!